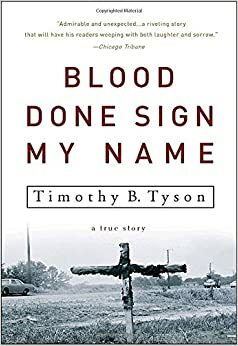 Blood Done Sign My Name is Timothy B. Tyson’s memoir/reflection on racism in America. He takes as his starting point the 1970 murder of Henry Marrow, a 23-year-old veteran gunned down as he pleaded for his life by Robert Teel and two of his sons. The Teels were neighbors of young Mr. Tyson, then in his early teens. None of the Teels were found guilty in spite of ample evidence against them. I was shocked to find out that as late as 1970 a white man could still kill a black man with impunity in parts of the United States. I shouldn’t have been. I knew that public lynchings continued well into the 1960’s. But I was just as shocked as I am by recent events in Florida. The situation is not the same, I know, but that said it’s still the same. Mr. Tyson provides enough detail in his account of Henry Marrow’s murder and the subsequent trial to satisfy anyone looking for a true crime story, but his goal in Blood Done Sign My Name is much greater than that, much more profound. Mr. Tyson seeks to expose the history of white supremacy in America and its long lasting legacy on our culture. He does an admirable job. There is much food for thought in Blood Done Sign My Name–it will prove difficult for many readers to get through it without taking a close look at their own position in American society. It’s not a comfortable thing to do, but it’s something we all should do now and then. I stated in a recent Sunday Salon post that American history can be seen as the history of racism and the struggle against it; I think Mr. Tyson would likely agree. His book traces the myth of white supremacy back through the civil rights struggle, the Jim Crow era to reconstruction and the days of slavery. Much of the territory he covers has been left out of the official versions of U.S. History. For example, Mr. Tyson lays out a convincing case that it was not the peaceful non-violence of the 1950’s and 1960’s civil rights demonstrations that ended segregation. He does credit them for moving the country and the courts towards landmark actions like the Brown V. Board of Education decision and the Civil Rights Act of Lyndon Johnson’s first year in office. However, Mr. Tyson argues, these did not bring about actual change on the ground until resistance began to turn violent in the late 1960’s and early 1970’s. It was only when blacks began to riot that real change happened in places like Oxford, North Carolina where Henry Marrow was killed. This is not a reading of history we are comfortable with. We like to believe that peaceful demonstration was all that was needed, all that is still needed. Blood Done Sign My Name tells a different story. Mr. Tyson, now a professor of African American history, comes from a long line of preachers, men who advocated for greater acceptance between white and black America often at great personal risk. So if Mr. Tyson strays close to preaching now and then, I can forgive him. A good sermon is a form of entertainment worthy of a donation. I hope someone is using this book in a high school class somewhere, or at least with college undergraduates. It’s a well written book and an excellent way to begin looking closely at an issue that has haunted America since before the pilgrims landed at Plymouth Rock and one that continues to haunt us to this day. I first ran this review back in March of 2012, but I don’t think I’d have to change much to make it current today. Just refer to a more recent killing than Trayvon Martin. This year, I’m embarrassed to admit it took that long, I became a member of the Southern Poverty Law Center which is devoted to tracking and combating hate crimes and hate groups. Here is a link to them just in case you’d like to find out more about them and their work.